Water scarcity and land degradation strongly affect the livelihoods of millions of households in Sub-Saharan Africa. Water for agriculture – used to grow the food and feed that people and animals need – consumes 70 to 90% of the all water used in the region. Over 14 million people live in the Blue Nile area. Two-thirds of this densely-populated area is highland, receiving high levels of rainfall. Rainfall, runoff and sediment are erratic; dry spells significantly reduce crop yields and sometimes lead to total crop failure. High population pressure and use of marginal land are causing land and ecosystem degradation in many parts of the Blue Nile, with significant loss of water quality downstream. The high sediment loads result in large costs for irrigation canal cleaning and reservoir dredging. Degradation also results in a downward spiral of poverty and food insecurity for millions of people in Ethiopia and the downstream countries. To meet the needs of growing populations, we need to reverse land degradation and improve water productivity. We need to produce more food with less water. One promising strategy is to adopt improved water management systems and practices. These can help to increase land and labor productivity, produce more food at a lower cost, generate employment and, in general, foster equitable economic growth. Rainwater management interventions, such as improving soil water holding capacity, enhancing crop and livestock water productivity, improving efficiency of small scale irrigation, efficient use of ground water wells, diversion, or water harvesting, can significantly contribute to poverty reduction. While different livestock feeding strategies and interventions can also minimize water depletion and improve positive impact on livelihoods, environmental health and resilience. The Nile Basin Development Challenge (Nile BDC) is funded by the CGIAR Challenge Program on Water and Food (CPWF) to improve the resilience of rural livelihoods in the Ethiopian highlands through a landscape (watershed) approach to rainwater management. Learning about rainwater management systems. This project reviews past and ongoing activities, compiles an inventory of actors, and identifies best practices for dissemination and use. Integrating technologies, policies and institutions. This project will develop integrated rainwater management strategies – to slow down land degradation and reduce downstream siltation. Targeting and scaling out of rainwater management systems. This project will better target or ‘match’ promising technologies with particular environments, thus overcoming the limited success and impact of many past agricultural development efforts. Assessing and anticipating the consequences of innovation in rainwater management systems. 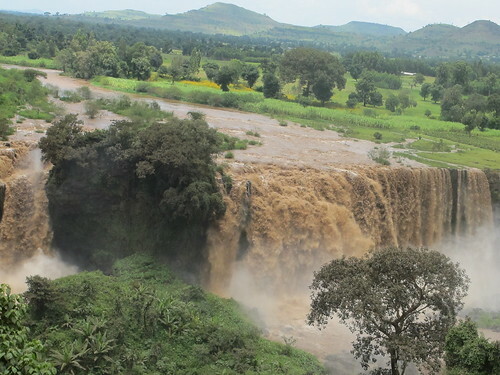 This project will quantify the consequences of improved rainwater management, measuring downstream, cross-scale consequences of successful innovation in the Ethiopian highlands. Catalyzing platforms for learning, communication and coordination. This project provides a multi-stakeholder platform for all the projects in support of improved communication, innovation and adaptive management. If this development Challenge is successfully met, best practices for rainwater management will be developed and implemented at landscape scales across agro-ecosystems in the Ethiopian Highlands. These will minimize unproductive water losses, soil erosion and nutrient mining across landscapes. Appropriate rainwater harvesting technologies will be deployed, maintained and monitored. Small-scale irrigation techniques would allow farmers to efficiently irrigate their crops and forages. The management system will enable farmers to exploit rainwater for multiple uses, including livestock and fisheries. And overall landscape water productivity will improve. There will be policy adjustments which yield greater focus on rainwater management in the Blue Nile Basin. The system will integrate the needs and decisions of local (formal and communal) institutions, which will in turn work to implement and maintain it. The success of the projects, and the lessons learned will prompt its uptake by government and development agencies leading to the widespread implementation of the system across the Nile River Basin. To ensure that the five projects are well-connected with each other and with other stakeholders, a coordination project will foster learning in support of improved practices and adaptive management across the Nile BDC projects and with other related initiatives. Impact pathways: facilitate interaction of all Nile BDC projects, developing a network map and impact pathways that align all research activities and outputs to deliver outcomes and impacts, and deliver good coordination, quality research and adaptive management. Networks and platforms: engage networks of actors and stakeholders, fostering improved rainwater management, catalyzing institutional change, facilitating joint learning, and influencing behavior. Communication: Capturing, processing and communicating key lessons from wider BDC actors and projects, facilitating information flows and linkages among sector actors, creating regular forums where investors and development actors interact and debate with policy makers at regional and federal levels. Capacity building: Mentoring project teams and wider actors to strengthen their capacities, putting in place quality controls, and improving skills in project design and management. Gender mainstreaming: Use (and facilitate projects to use) socially-optimal facilitation approaches to curtail elite capture of project activities and impacts by more powerful groups. Generate project outputs that are useful, appropriate and accessible for women.